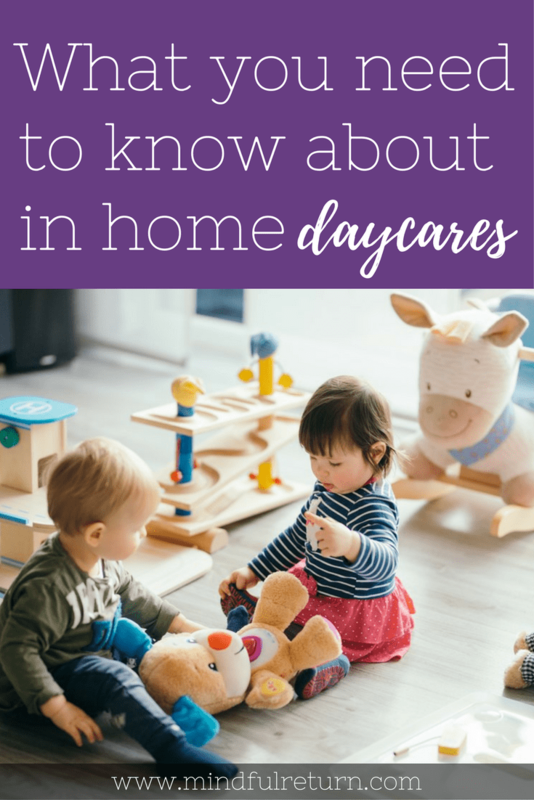 Have you ever wondered exactly what in-home daycares are? How they work? Or the pros and cons of selecting them as your caregiving option for your little one? The Mindful Return blog has, at some point, covered pretty much every type of child care arrangement available. (See the list below for a whole roundup of great articles on childcare related topics.) Yet until now, I hadn’t dug into the in-home option. 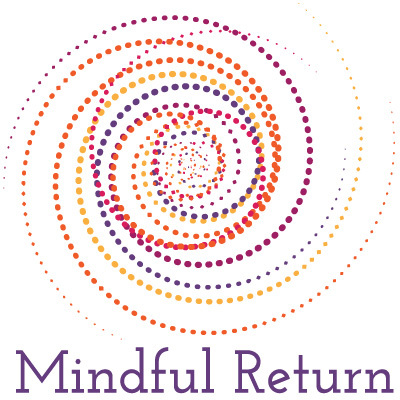 Turns out many of my Mindful Return alumnae have used in-home providers, and four wonderful mamas – Yvonne Carney, Devon Mayer, KL, Jewelyn Cosgrove, and Monica Taylor, were willing to share their detailed and deeply personal insights. Here’s what they had to say, when I interviewed them about their experience with in-home daycare. Yvonne: In-home day care is licensed care that is run out of a provider’s home. At least in Maryland where I live, the provider must meet requirements set by the State about how many kids can be in the provider’s care, the training required, curriculum, safety exits, etc. The space varies tremendously. For our older daughter, the provider had dedicated space for the child care center that was a light-filled addition to the rear of her home (12 kids total, 4 of whom were infants in the house next door). With our twins, we’re on our second in-home daycare now. The first was in her living room. With their current provider, the entire first floor is for the daycare (8 total kids). Devon: Licensure and certification varies by state. Even with licensing requirements, there may be exemptions. So, if that’s important to you, be sure you understand what your state or locality requires. In Maryland, in-home day cares are licensed and regulated and they receive an annual inspection from the state. The age-based provider-to-child ratio is the same for all provider types. They vary from a shared space in someone’s home (think living room with baby gates) to a completely separate space with separate entrance, bathroom, kitchen, etc., such as a finished basement. It may be decorated and look similar to any other day care center, or it may look like a living room with some toys in it. KL: We have had 2 slightly different daycare experiences. One was a licensed in-home day care, operated very similarly to a daycare center (set hours open each day, signed contract, etc). In a townhouse, most of the main level was used for daycare. There was outdoor space in the back, and the basement was used for naps only. It was a fairly tight space. I forget the exact number of kids, but it was between 5-10 kids with 2 adult caregivers. Our current in-home daycare is very different. It is not licensed. There is no set contract, other than our e-mail agreeing to rates, schedule, etc. It is also located in a townhouse, but it is more spacious, and areas are set up for the kids on all levels. There’s limited outdoor space, but they frequently take walks or go to the playground. Currently, there is only one other child other than my 2 kids, and there are 2 adult caregivers! They’ve had as many as 4 kids. Jewelyn: An in-home daycare is a daycare hosted inside someone’s home. You should look for one that is well-regulated, which will ensure it meets the same safety standards of a traditional group daycare setting. 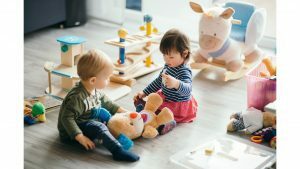 These standards include limited numbers of kids, fire code, protective mechanisms like baby gates, and structured educational time (songs, dancing, playtime, meals). Licenses should be posted for you to review. It straddles the line between a traditional daycare setting and the personalized care of a nanny. In my area, state and local law requires a backup care provider be lined up in case Ms. K is unable to open one day for any reason. Though to date, we’ve never had an issue. We use a lovely woman who lives about 5 minutes from our house. There are two other kids during the day who are varied in age. The living room is entirely outfitted for play areas and sleeping areas, just like a bigger box daycare. Ms. K has cribs just like the ones at a bigger box daycare, cots too, and lots of games, toys, puzzles, and books. Each kiddo gets their sleeping area and a place to eat their meals (high chairs and then a table with baby chairs). Activities are designed and structured for their ages. My two-year old daughter comes home with paintings and crafts. And she says goodbye to every single person when I pick her up. Monica: An in home childcare is a daycare in another person’s home. Sometimes they have an assistant or two, and sometimes they work on their own. Since the childcare takes place where the provider lives, they often have a floor or section of their home dedicated to this, and sometimes a separate entrance. Where I live, a single provider is allowed to have two infants under age 2, and up to six additional kids over age two. Providers with assistants can have more infants, but there is usually a cap of 12 of children, unless the home has additional space. Typically, in home daycares, infant spots are full. But toddler and preschool spots are open, because at age two, many parents move to a center or have additional options. Q: How did you decide on sending your child to an in-home daycare? Yvonne: We like that in-home care is usually a small number of kids. You really get to know the teachers — they begin too feel like family. We also like that the day is typically somewhat structured like you would find in a day care center (schedules, circle time, meals provided). Price is definitely a factor, especially since we have three kids now (one in preschool, and two 8-month-old twins). Devon: There are no licensed centers nearby that accept infants at 12 weeks. We chose not to look into centers run by religious institutions specifically because they are exempt from state licensure and regulations. KL: We originally decided on an in-home daycare, because they were a close family friend, and we felt very comfortable leaving our daughter with them. We honestly did not research any other options. Jewelyn: We were finding it hard to work with the bigger daycare provider on some of our concerns with our daughter’s sleeping habits. They wanted to move to one nap earlier than she was really capable of doing. It made evenings much harder in our house, with a cranky, sleepy baby we didn’t get much time with. We also weren’t in a care setting super close to our house, so the commute during rush hour was a mess. We found an in-home daycare provider five minutes away and went to talk to her. She was wonderful. We felt comfortable choosing her, so we took the leap. It’s been an amazing experience. Monica: We decided on home daycare for our first, because after looking at various options, it seemed personable and cost effective. All of our boys started in this setting. My older ones moved to a center at age 2 or 3, and my younger ones are still in a home childcare. Q: How did you choose your particular provider? Yvonne: For my older daughter (who was in in-home day care until she was almost 3), I found the provider through the local Moms Listserv. Other moms raved about her. We went to visit and knew it was the right fit. With my twins, it’s been challenging to find a provider that has two spots open at the same time. As a result, we’ve gone with providers that are certainly keeping my kids safe, well-fed and entertained. But they don’t provide the bells and whistles I was used to with my older daughter’s provider (monthly newsletters, texts to check in on a sick child, field trips). Devon: We went through a child care management agency that vets in-home providers (above and beyond the state licensing requirements.) The agency asked about the hours of care we needed, our location, our commute route, and cost needs, and then matched us with the best fit that had an opening. To be honest, I wasn’t thrilled with the first visit and I kept looking. I ended up speaking to two parents whose children previously attended and went back for another visit. Turns out my first impression was terribly clouded by the sleep deprivation of too many sleepless nights. The second visit was great and erased any concerns. We are so, so happy there. KL: Our current provider lives in our neighborhood, and we knew we needed to make a change from our prior provider, primarily because of logistics and commute. She advertised her services on our neighborhood email list, and we reached out. We felt it was a great fit. Jewelyn: We took a referral from the local licensing office with a list of city daycare providers who had passed their licensing requirements. We selected Ms. K, even though she was just opening her own daycare that month. We interviewed her about her past experiences working as a helper in another in-home daycare, asked what she hoped to do differently, and gave Addy a chance to play with her. It was clear she was wonderful, engaging, and great with kids. We met her whole family and instantly loved all of them, too. Monica: We chose our provider by searching. With our first son, we used a service called Locate (free) which gives a list of licensed daycare providers in your area. Then we visited, until we found a good fit with an opening. With our third son, the provider who watched our first two was not taking new kids at that time, so we started looking again. Proximity to home and affordability were two big factors in our search. Q: How does the cost of in-home daycare tend to compare to other child care options? Yvonne: About 30% less expensive than daycare center or nanny. KL: Much lower and more flexible. I am currently working two days a week and pay $100/day for two children (1 and almost 3) for a 7:30-4pm day. If needed we can add additional days depending on availability. Jewelyn: Candidly, we’re saving nearly a grand per month. It’s the least expensive option in our area by far. You do lose out on some of the amenities of a more traditional daycare. It lacks some of the fully exclusive benefits of a nanny. And you still have to contend with a commute. But we’ve found it to be completely worth the price. Monica: The cost of home daycare is usually cheaper than a nanny or center during the infant stage, but can be more as the child gets older. It depends whether the provider adjusts rates for the children’s ages. It also depends on whether or not the provider is willing to go part-time if needed. When I returned after my 4th, I was only working 3 days per week. Luckily, my provider was willing to only charge me for those 3 days. At a center we got into close to our house, they would only take full-time infants up to age 2.5 years, before they would consider part time. Q: Where does one go / what are some good resources to use to locate good in-home daycare options? Yvonne: CareLulu; The State of Maryland; Monday Morning Moms (network of in-home providers in Montgomery County, MD). friends, family, neighbors, local list serves. KL: We found ours through our neighborhood e-mail group. Local Facebook groups, mom groups, and friend referrals are great sources. Jewelyn: There are state and local licensing offices that will provide information to you. And, of course, mom groups and blogs for your local area can let you know if there are openings. If you have a friend using an in-home, ask them to ask their provider if they know of another care place with an opening. It’s a tight-knit community! Monica: To find good in home daycares, many states and counties have a Locate program, which lists licensed daycares and helps with the search. Our county also has a paid service called Monday Morning Moms, which pre-screens providers, gives them materials, and also takes care of the financial details for the provider. Word of mouth is also helpful. I checked local listserv and asked friends and neighbors who they had used. Q: What’s your back-up plan in the event the caregiver is sick or otherwise unavailable? Devon: The agency we go through guarantees back-up care. All providers get 1 week of paid vacation per year. When ours goes on vacation, we take our child to another provider at no cost. Our provider has called in a substitute when she or her helper are sick. We have never had an unplanned closing in almost 2 years there. They are closed on several holidays, but we also have those days off, so it’s not a problem. KL: This has been one of the drawbacks. We do not currently have a back-up plan. One of us will typically stay home with the kids. It does not happen often (our kids are sick more than the caregiver), but when it happens unexpectedly, it is challenging! Jewelyn: In my area, the care provider is required to have a backup plan. Under law, an in-home daycare can absorb some of the extra kids if another care provider is under the weather temporarily. Or they can have a backup come over in their stead. I was told the backup plan up front, and I was able to ask any questions I had. Likewise, they’re also required to have an evacuation plan and an evacuation address to meet, just in case. It’s a nice peace of mind to know these things up front. Monica: When I was at a home daycare with more than one provider, they usually had a back-up if someone was sick. With our current daycare as a single provider, my husband or I take off if the provider is sick or out of town. She provides advanced notice for those times she is out of town, and we schedule our vacation time around that. She is rarely sick, so we haven’t had to worry about that. Q: What are some the benefits of your arrangement? Yvonne: The kids are getting lots of opportunity to explore and learn each day, from someone with lots of experience in child development. It’s also cost-effective and close-by. Devon: No snow days! Since she provides care in her home, as long as we can get there, she is open! Due to its small size, they are able to be very accommodating. My son had acid reflux and had to be held upright after eating until he was 6 or 7 months old. I ended up nursing him at day care in the nap room every morning at drop-off and was able to hand him over to be held, so I could get on my way to work. We’ve had to ask for early drop off several times due to a work obligation, and they’ve always said yes. They absolutely have a sick kid policy, but I think it may be slightly relaxed from what a center would enforce. They are licensed for a max of 8 kids, so chances are the other kids are already exposed to whatever your kid has (or gave it to your kid!). KL: Flexibility. In our current arrangement, we are not charged for days our children do not attend (sick, vacation days, etc). For us, this is a huge benefit, especially because my husband is a teacher and we reduce the number of days during the summer! This is probably not a common scenario, but when we adopted our son a year ago, we had 24 hours’ notice, and we were out of town for 2 weeks followed by a 4-month leave. We went from having our daughter in daycare 4 days/week to 1 day/week during my leave, and then having 2 kids in daycare following my leave only 2 days/week. I do not think this type of arrangement and flexibility would have been possible with a daycare center or even a nanny. Again, probably not typical, but since the daycare is in our neighborhood and I primarily work from home, I am able most days to walk my kids to daycare. This has been a great perk for my own well-being. Personally, I love the intimate level of care with in-home daycare. I interact on a daily basis with the caregivers. My kids get home cooked meals sitting at a kitchen table. And the child-to-caregiver ratio is very low. It is more affordable than a nanny or au pair, but I still get the benefit of the kids being in a home setting versus a large daycare center. Jewelyn: I love how well I know Ms. K compared to how well I knew my daughter’s caregivers at the more traditional daycare. I know her name, her laugh, her kids’ names and her husband’s name. With the more traditional daycare, I only knew my daughter’s primary caregiver’s name, and I never felt like I had much time to get to know her or her likes/dislikes. Ms. K truly loves my daughter, and my daughter loves her (though I’m still her very favorite!). We also don’t get sick as often – not quite as many kiddo germs! We still get sick more than if we were all sequestered at home, but it’s much more manageable. We also have more flexibility if we’re running late. We can text Ms. K, and she always says, “No problem!” Oh, and those snow days have been better, too. We had an issue with our old daycare closing for a full WEEK even as workplaces reopened. Ms. K is much more flexible for us and puts my working mama’s mind at ease. Monica: My current arrangement has lots of benefits. The provider is the same person who watched my two older sons (she had room again when my 4th came along). She is willing to go three days per week, since I’m part time. My two sons are the only children she watches, so it’s like having a personal nanny but at their house. She teaches my toddler many concepts and is preparing him for preschool. She also takes them on walks and to playground, which my kids love. Q: What are some of the challenges? And how have you addressed them? Yvonne: The first provider we were at with my twins was kind, but not as experienced as I would have liked. So we’ve since switched them to a more experienced in-home care provider. Devon: We’ve been really lucky, we haven’t really had any issues. They don’t provide any milk, meals or snacks. It’s not a big deal, but I think other places at least provide snacks and it would be nice not to have to worry about packing it. KL: Just as flexibility has been afforded to us, we sometimes have to be flexible in return (changing days because of provider commitments, sick days, vacations, etc.). The biggest challenge has been differences in style, as you ask in the next question! Jewelyn: The only challenge was probably in doing the research. It’s not like a lot of these places have websites, so it has a lot of the same unknowns and nerves that you’d get while interviewing a nanny. You also get the sense that the other kids still come to daycare somewhat sick and don’t get sent home, because they’re not as stringent as a big box daycare. That said, as a working mom, frankly some days I don’t have much of an option. When she’s just not herself, those days you are in that “should I/shouldn’t I” conundrum about sending her to daycare, I tend to default to go for it and ask Ms. K to call me if she gets worse. It’s a double-edged sword, but we do our best, and so does she. Monica: A challenge of home daycare is needing to pack all my kids’ things and drop everyone off on time. It would be so much easier if someone came to us. We try to pack the night before and drop off items in bulk ahead of time (diapers, extra clothes, etc). Before we were in our ideal place, we were in a few home daycares that went over their numbers and did not have the correct ratio of kids to adults. I should have reported it, but instead chose to leave when we could. We were also in a setting where the assistants did not speak much English, and the main provider was not always around at pick up to answer our questions. We left that situation when we could. Q: Have you had any differences with your caretaker about child rearing styles? If so, how did you address them? Devon: Not really. Our son received early intervention services (OT) from the school system due to some delays, though, and our provider kind-of brushed off our concerns about his development, telling us he was fine. He is back on track now and no longer needs the services. But I can see how that could have been challenging to try and get them on board with any recommended therapy techniques. KL: With our first in-home daycare provider, they were a close family friend. Our initial thought was that this would be a great scenario, but we did not feel comfortable pushing back when there were differences of opinion. For example, my daughter frequently spit up until she was one year old. There was no medical concern per our pediatrician, and we just dealt with it. But the providers frequently engaged in conversation about this and their concerns. It was exhausting for a new mama. Ultimately, we made the decision to move our daughter to a different daycare, primarily because of logistics and the commute. With our current provider, there are definitely differences in child rearing styles, mostly what we witness with their own daughter. As a mom, you learn to pick your battles. And while I may be frustrated at times I try to focus on the big things: are my children safe, happy, loved, etc.? As long as the answer is yes, I will not “worry” about the differences in how we might approach parenting situations. Jewelyn: I haven’t personally, and in fact I would say we align more than anything. We also have a lot of conversations about new problems, and we work together to address them consistently. It’s SO much easier with her than with our prior daycare setting. Monica: We have had differences about things like pacifier use, bottle vs. cup, amount and timing of naps, etc. with various providers. We try to focus on what our pediatrician has recommended and try to compromise when possible, while staying firm with things that are really important to us. Q: Any recommendations you have for others who may be considering in-home daycare for their children? Yvonne: Shop around. There is quite the range in terms of care provider experience. Devon: Get recommendations from others. Ask for references. Talk to the parents of other kids at the daycare. Check online for the most recent inspection reports (if available). Visit the daycare during the day when the kids are there. Bring your kid with you to see how they interact. Ask the same questions you would of any provider, such as: routines. Feeding. Naps. Holiday and inclement weather schedule. Sick kid rules. Whether food is provided. Hours of operation. What daily report you’ll get. How they discipline. Whether they leave the premises (park, field trip, etc.). Late charges. Payment method. And whether they give you a receipt you can use for your taxes. KL: Don’t be overwhelmed by the range of what is considered an in-home day care. Licensed or not, be comfortable with the provider and the space they are using. Ask for references. Don’t be afraid to negotiate for what you need and to adjust along the way. The relationship with our current daycare provider is continually evolving, and honestly that is why it has worked so well for almost two years. Jewelyn: Do your research, but don’t hesitate. I felt most uncomfortable with this setting when I did all my research before the baby arrived. But I regret not giving it a chance sooner. It’s the perfect fit for our family. If you go at it with the same care and attention you would a nanny, you’ll be doing just fine. Monica: Go with your gut. Take advice from others on quality places. Speak up if something doesn’t feel right. Be honest, and don’t be afraid to make a change when something isn’t working. Yvonne Carney works full-time at a public transit agency and has three kiddos, a 4-year old daughter and 8 month old boy/girl twins. She and her husband live in Silver Spring, MD. Devon Mayer loves being a mom to my almost 2-year-old son. She is a senior health policy analyst in the DC area, focused on long term services and supports. Jewelyn Cosgrove is a working mom to a sweet little girl. She currently works as a lobbyist in Washington, DC. Monica Taylor is a mother to 4 beautiful, energetic boys, and is a special education early intervention teacher. What is back-up childcare, and how does it work? An interview with 3 working mamas. 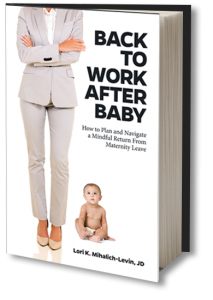 Want more help with the transition back to work after maternity leave? Join other new mamas returning around the same time you are, in the next session of Mindful Return.